in the art of Eyelash Extensions. Save time, money and your reputation by learning correctly the first time! The Lash Bar offers professional, experienced and knowledgeable Eyelash Extension Training and Certification to professionals. The art of eyelash extension application should never be learned by experimentation or watching an instructional DVD. Jill De La Torre is a licensed esthetician, educator and a pioneer in the field of lash extensions bringing them to the valley over a decade ago. Jill's training experience is extensive, spanning over eight years. In addition to training top salons in many of the "beauty Mecca's" of the world such as Italy, Los Angeles, New York and Las Vegas, she has also trained some of the Arizona's best. She is one of the most sought after professionals in the country for both application and training. Never place your professional career and education in the hands of an unlicensed individual(s) or salons who one day "decided to become instructors " or in companies that are so irresponsible they will sell a kit to anyone who asks--regardless of their qualifications and without insisting they first complete a hands-on training course. This is important now more than ever as there has been a huge increase in emergency removal appointments for people who have received "botch jobs". Take the time and effort to do it right the first time! Invest in your career by completing a proper, hands-on, training course with one of the most experienced lash extension educators around. When and where is the class held? Classes are held in Arizona. If you are traveling, we can provide a local model for you to work on during the "hands-on" portion of training. Workshop classes used to be held throughout the year on a monthly basis. However, with busy/conflicting schedules or those only being able to travel on certain days, alternative dates were constantly requested. We found it is most convenient for students if we determine class dates on an individual basis. If you have made the decision to attend a workshop class, please contact us directly for the next and soonest possible dates available. We are usually able to get a new student in for a class within a few short weeks from the day they inquire. Please note the date can not be officially reserved until registration and payment is made. There are no refunds once you have registered as we will have purchased your professional kit and locked in days for your training. If an emergency arises, reschedules are possible. How much is the class and what is included? Classic, Traditional Eyelash Extension Workshop is $999.00 which INCLUDES the full kit. Classic Traditional & Russian Volume Combination Workshop is $1499.00 which INCLUDES your full kit with tools/supplies for both methods. You may have shopped around and noticed other classes cost several hundred more or are about the same price, but do not include the kit (an additional $400-$600) As mentioned, Jill's training experience is extensive and her training classes are superior. The reason for the lower price is quite simple: low overhead. TLB is able to offer classes at a lower price because we keep costs low in other areas, which in return, benefits you. Kits include everything you need to get started plus enough lashes to do an additional 50 full sets. Jill personally assembles each kit. Some competitors may include lash styles and sizes in their kits that are overstock or odd sizes rarely used on clients. This forces you to have to make a purchase immediately so that you have some "normal" sizes to begin working with. You can be sure the lashes provided in TLB kits are sizes most commonly used on a day to day basis. What topics are covered and will I be ready to do clients right away? The class is divided into two portions. During first half, we will cover everything on the list below. We have also updated our training to keep up with issues we are are seeing today that will be affecting you (i.e. "bad lash jobs" etc.) As unfortunate as it is that this is becoming such a problem, it should also be looked at as an opportunity to gain new clients. We will teach you how to handle this growing problem that will undoubtedly cross your path and how to educate and turn "corrections/fixes" into permanent clients for you! The second half of the class is "hands-on" in which you will need to provide a model. After class, you will need to go home and practice what you have learned before you will be ready to take actual, paying clients. On average, it takes about 10-15 practice sessions on models (friends/family) before one has the speed, technique and confidence to begin officially offering this service. What if I would like a private, one-on-one class with Jill? Will you travel to our salon? Yes. For parties of 3 students or more, local, in-salon training can be arranged. Out of state, in-salon training may also be arranged for parties of 4 or more. Please contact us to discuss terms and/or arrange a training for your salon. Dealing with the "Correction Client"
"Shop Talk"- Tips/Techniques About the Business, "Stuff" Learned the Hard Way So You Don't Have To! What if I feel I need extra help? Don't worry! When class is over with, Jill won't ditch you! She is always available to answer any questions you may have or help you with anything you are struggling with. Once you have taken the class, you are welcome to come back at any time, as many times as you want, and take any portion of the class again for FREE. In addition, you are welcome to schedule a time to come "shadow" and watch a session with Jill and one of her clients. needed to be called a certified eyelash technician. Thank you Jill De La Torre! 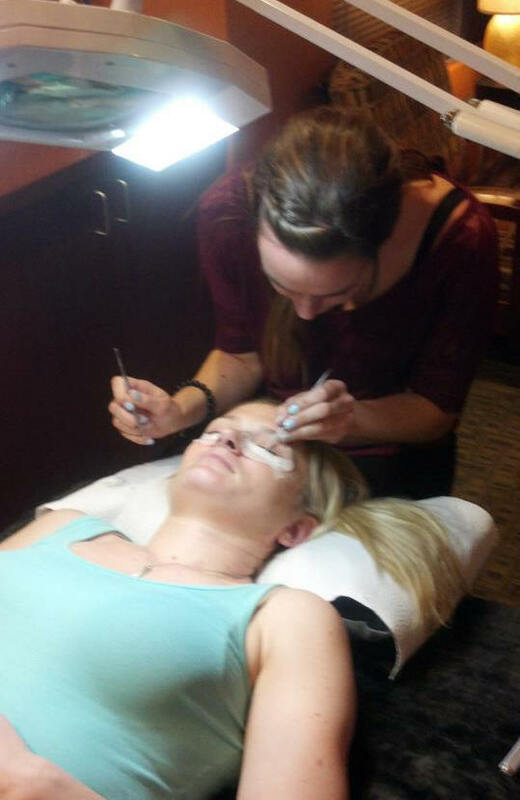 "I attended G Skin and Beauty Institute in Chandler. I paid extra for their "lash course" they recommended. There were 10 people in the class --- way to many and way overcrowded. I got virtually no hands on training due to too many people in the class. I was left with a kit I could do nothing with as I didn't feel confident applying lashes. I explained my problem to Jill and she was so helpful and knowledgable. I ended up taking her class and WOW----I can not believe what I wasn't taught and didn't know about this process in order to be successful." "Unfortunately, I was one of those who did not take the time to learn extension application the first. I came to Jill with some pretty bad habits. Jill was extremely patient and helped me correct what I was doing wrong. Since then, l have been able to retain the continued business of almost every lash client that comes my way. Thank you, Jill!" To sign-up and reserve your class date, please contact us today!